The RunnerDuck Note Pad, step by step instructions. This project appeared in our August 15th, 2003 Newsletter. Marilyn came up with this cute idea for a note pad and I liked it, so I made it. A lot of times that's how we come up with our projects. We hope you enjoy this one as much as we did. Here is the pattern and larger pictures of this project. Just click on the picture below. Trace the Pattern onto the piece of wood. 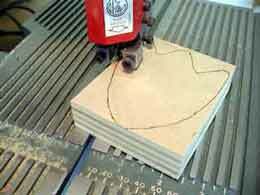 Cut two small pieces large enough for the feet. Trace the foot pattern onto one piece. Put the two pieces together with double backed tape and cut out both at one time. 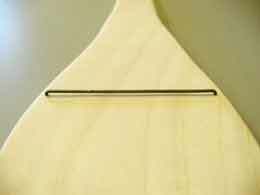 Cut a piece 4 1/4" X 1 1/4". 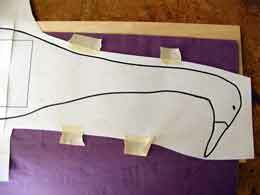 Glue the feet onto the piece and the piece onto the duck body as shown in the pattern. Clamp them in place until dry. Bend the wire 90 degrees on both ends just a tad wider than the note pad. Cut each end to about 3/8" long. 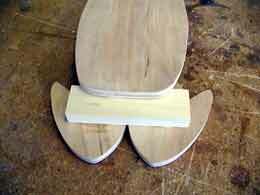 Put the note pad on the duck so that the bottom of the pad is just a little above the toes of the feet. Mark both sides of the pad at the top. Using the wire mark the location to drill the holes. Drill two 1/16" holes through the duck body. Adjust the wire to fit into the two holes. Check that the note pad will hang on the wire when it is inserted. Remove the wire and apply a small amount of glue and put it back in. Leave just enough space for the cardboard of the pad to slide through. Paint your duck and put a picture hanger on the back. Like all of our projects this would make a great gift or fun to use for yourself. We hope you've enjoyed this project and have good success with it. Remember, if you ever have any problems with our projects just drop us a line and we'll try to help. Since we build every one of these projects we have a pretty good idea of how to get through them. We also make lots of mistakes so we can help avoid them.